← TRC #513: Mashup: Boil Hot Or Cold Water? + Maple Water + Does Bottled Water Expire? This entire episode is a strawman. How about a firsthand account? Fair enough. What said, specially was invented or exaggerated? I.e. what would you never be able to find documentation of something said here actually being said by flat Earthers? I didn’t catch anything. Furthermore….A listen to Stuart’s three part series on this comes complete with a sound bite from coast2coast am for each claim. We just did not have time to go that deep. For a lark, I joined the Flat Earth Society chat board a while back. My subjective opinion, based on my observations and participation in this board, is that the only people who actually believe the Earth is flat are severely mentally ill, and are a very small minority of participants on the board. A larger number pretend to believe (it’s much more fun on that board to post as a believer than as a denier), and the largest number by far are there to try to convince people that the Earth is round. It’s actually rather sad to read posts on that board from people arguing that the Earth is round, considering that most of their audience knows it perfectly well, and the rest are so completely dissociated from reality that they are unreachable. 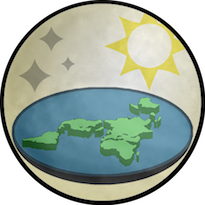 It seems to be generally understood by all, roundearthers and flatearthers alike, that “round” actually means an oblate spheroid, not a perfect sphere, and “flat” does not meat perfectly flat, since there are obviously mountains and valleys. Interesting stuff, Daniel. Which board was this? Also, Stuart has an update about flat earth on this week’s show. The board is theflatearthsociety dot org. It’s really kind of fun as long as you don’t take it seriously. As Stuart hinted, there are many different versions of flat Earth, so arguing with them is a moving target. It’s so much more fun to play along. And thanks for the heads-up about Stuart on this week’s show. I’m behind on the episodes, but I’ll get to that one soon.